Throwing a Mexican Summer Fiesta by Ann Hazard. What could be more fun than throwing an authentic Mexican Fiesta! Whether it's for six people or a dozen, you can plan it all right here! You ready? Let's start with the Dress Code: The tropical theme works beautifully this time of year. Ask people to wear Hawaiian shirts, flowing tropical-print dresses and flip-flops. You can even request that they take off their shoes when they come inside and do the party barefoot! The following menu has been created for a guest list of eight. It's not difficult - but it's delicious, and your fiesta is guaranteed to be memorable. 1. Decide on your fiesta's date, time and guest list. 2. For DECORATIONS, it's time to check out what you have on hand before making a list and heading out to the party store. First of all, you need to decide if you have enough "nice" dishes, utensils and glasses to serve eight people. You'll need 16 small appetizer/dessert plates as well as eight dinner plates, eight glasses, plus enough utensils for dinner and dessert. If you have all that, great! If not, go with paper and plastic. It's plenty festive and much easier on the cleanup too! 3. Time to go to the party store. Pick out some invitations with a Mexican or a tropical flair. (If you'd rather not send invitations, what about email? Or just picking up the phone? After all, this is an intimate party and these will be your closest friends.) Pick up one red and one green tablecloth-plastic preferably, or pick some wild, tropical colors. Buy some fiesta-looking paper napkins. Get all the plates, napkins and utensils you need. Most party stores stock Mexican wall decorations, colorful paper flowers, pi�atas and centerpieces. Get about a dozen or two small votive candles and as many lunch sized brown paper sacks. On the day of the fiesta, you will fill each with some sand or soil, insert a candle and place two rows of "luminarios" along the walkway to your front door. 4. For music, visit you local store and ask the sales clerk for some recommendations on toe-tapping, lively Latin music. Linda Ronstadt, Gloria Estefan, Ricky Martin, Julio or Enrique Iglesias, the Gypsy Kings, Santana-any of these will help get your guests in the right mood. You might also want to ask for Latin versions of your favorite Christmas carols. Don't forget the Jimmy Buffet music. He's always a great mood-setter-especially with a tropical party theme! 5. A couple of days before the party, make your grocery list. Do your shopping at MexGrocer.com. 6. Before the party begins, set up your buffet and your bar. Make sure you have enough seats, either at a dining table or (more casual) in your living room so that everyone can sit down and eat comfortably. 7. Lay out your most festive, fun serving plates. Lay out the ingredients for all the dishes you'll be making in the area of your kitchen where you'll be preparing them. Decide who to assign as your assistant. Be sure to notify that person ahead of time and ask him or her to come a little early! Now, get dressed, light your luminarios, crank up the tunes and get ready to have a blast! Remember, FIESTA spells good times for everyone!. Sangr�a Blanca is a lighter, less potent wine punch that is perfect for a summer evening. It's made with white wine, limeade, club soda and pineapple (instead of burgundy, brandy and the more hearty fruits used in Spanish-style Sangr�a), it's lighter and more tropical in its flavors. This makes approximately a gallon and a half and takes about 20 minutes to prepare. Place limeade, water and ice cubes in blender and blend until slushy. Pour half mixture into each of two large pitchers. Pour half of the wine and half the club soda into each pitcher. Garnish chilled wine glasses with lime and a pineapple chunk. Serve immediately. Delicately spiced and elegant, this will dazzle your guests. If you choose, you can use reduced or non-fat mayonnaise and then sit back and smile as you watch those fat grams shrink. Serves eight and takes about 30 minutes to prepare. Flake crab meat and combine with hot pepper sauce, celery, mayonnaise, lemon juice, seasoned salt and pepper in large bowl. Place avocado halves on shredded lettuce. Fill with crab mixture and sprinkle generously with chopped eggs. Garnish with pimento strips, lemon and tomato wedges. To make herbed mayonnaise dressing, combine mayonnaise, tarragon and chives in bowl. Add just enough tomato puree to make dressing pourable. Serve on the side. This exotic salad has a Spanish heritage. Molded Gazpacho Salad is simple to prepare, but delectable and elegant. It's fat-free and serves eight. Takes about a half hour to prepare - but make it the day before so it has enough time to jell! Because the sea bass (it's called cabrilla in Mexico) and vegetables are baked together with wine, chipotle chiles and cilantro, the fish takes on a distinctive, mouth-watering flavor. Serves eight and takes about an hour to prepare. It makes a lovely centerpiece for your dinner buffet. Season fish on both sides with salt and pepper, garlic and lemon juice. Sprinkle diced chipotle chiles over top. Melt butter in large skillet. Brown fish on both sides. Transfer fish and juices to a 9 x 14 inch baking pan. Arrange onion and potato slices around fish and bake at 375 degrees for 30 minutes. Add tomatoes, pour wine over fish and sprinkle with cilantro. Bake ten minutes, or until fish flakes easily with fork and potatoes are done. Arrange fish on large platter with tomatoes, potatoes and onions. Pour juices over fish and sprinkle with cilantro. Garnish with remaining lemon quarters. Oh yum, yum, yum. Simple and exquisite, Baked Pineapple Delight combines the tastes of fresh fruit, rum and custard to create a memorable finale to any meal. Serves eight and takes about 45 minutes to make - but you can do this ahead of time so it's properly chilled. Serve with Cappuccino for a memorable ending to a memorable evening! 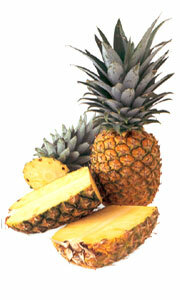 Lay pineapple on its side and take a thick slice from one side. Do not include green top. Set this slice aside. Carefully scoop out fruit and cut into bite-sized pieces. Mix pineapple pieces with sugar to taste. Flavor with rum. Put pineapple pieces back into shell, dot with butter and cover entire pineapple with foil. Bake at 350 degrees for 20 minutes.While pineapple is baking, make sauce by stirring together half and half, salt, sugar, egg, egg yolks, cornstarch and vanilla. Cook over low heat, stirring constantly until smooth and slightly thickened. This will take about 10 minutes. Chill until ready to serve. Serve pineapple warm with cold sauce on top and try not to blush when you get a standing ovation!